First published in 1978, this book represents a study of the ways in which Shakespeare exploits the possibilities of metaphor. 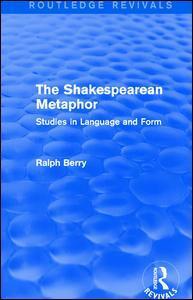 In a series of studies ranging from the early to the mature Shakespeare, the author concentrates on metaphor as a controlling structure ? the extent to which a certain metaphoric idea informs and organises the drama. These studies turn constantly to the relations between symbol and metaphor, literal and figurative, and examine key plays such as Richard III, King John, Henry V, Romeo and Juliet, Troilus and Cressida, and Coriolanus. They also provide a key to The Tempest which is analysed in terms of power and possession ? the dominant motif.